Take this blog, for example. I've got two, maybe three people who read regularly at best. Yet looking at my traffic stats, you would think that I've got a huge international following and that tons of other sites are regularly feeding me tons of traffic. Hello Latvia! Are you ready to rock?! Alas, no. 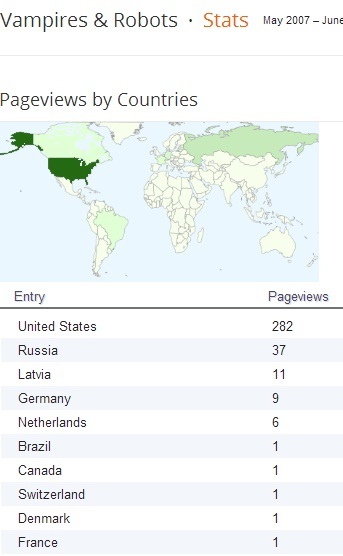 I'm not huge in Russia, that just happens to be where most of the fraudulent referral sites are hosted. It works kind of like this: I'm suposed to go to my stats page and see a huge boost of traffic. Curious as to what milkshake is bringing all the boys to my yard, I click on the referral link and either my machine is immediately owned (or is that pwn'd?) or I'm blindsided by a bunch of ads for natural male enhancements. Now, I'm not the most tech savvy, but I'm at least smart enough to copy the link into Google instead of clicking on it. And what do you know? All of the search results include the words "referral spam." Sadly, I realize that some people are going to click these links, just like some people are going to give their bank account information to imaginary royalty from Nigeria. But unlike the Nigerian prince scam, this one seems to lack a wide enough target. It just seems odd to me that someone would put enough effort into a scam that is only going to be seen by blog owners who routinely check their traffic stats. What you are looking at is a bunch of bots who have "favorited" a post I wrote back on May first. The post in question was meant to generate hype for the release of my second book. There's no dates on there, but every one of these was favorited well after the release was announced, the last one being today. Also, unlike real favorites, I do not receive any notification from Twitter that this has happened. What is the point of this? I've checked out a few of their profiles and all of their tweets read like bad poetry after a bottle of Wild Turkey and a 3am trip to Denny's (please don't ask me why I know what this type of poetry looks like). So what am I supposed to do here? Is the heady rush of flattery meant to make me follow them? Am I then supposed to engage the witty bots in conversation? Is that when they send me spam? I'm so confused! Half the people on Twitter are so busy posting their own promotions that they don't have time to care what anyone else posts and the other half are teenagers following real and fake celebrity profiles, so how does this work? Now, yes, I admit this looks like every other email or Facebook spam out there, but the weird part is that this was posted to my Goodreads inbox. You know, that other social media site that is about posting all the books you've read to feel smarter than your friends? At least I think that's what Goodreads is for. I'm not very good at it. Regardless, I know it's not a dating site and even if it were a dating site, it seems like it would be more of one of those Rom-Com movie dating sites where Zooey Dasch...er...long named googly eyed girl who isn't Katy Perry meets introverted book-loving Ryan Gosling, not OK Cupid or Craig's List Casual Encounters. Seriously, bots, it's like you aren't even trying anymore. I'm so lost on the internet these days. I'd like to say you cleared things up for me, but not really. I apparently am on goodreads, but I never post anything there. I think I got on in accidentally via my book club. Before reading this, I had not a clue at all what it was there for! I don't think I want everyone to know everything I read. That's going too far! You somehow sent me an invite as well, but I was already on goodreads so I invited you back. Social media really is awkward!